August 2011. Two babysitting, mix-ups. Two decisions with devastating consequences. Waterford, Ireland. Baby Tommy vanishes from his mother Carli’s car parked near the hairdressers where she is having her hair done for the local final of a national talent competition. Accrington, Lancashire. Baby Rose, left briefly ‘home alone when her ambitious lawyer mother Amy departs for a crucial board meeting, is not there when the family au pair returns home. The story unfolds through the eyes of Molly, recently widowed, who has lost her unborn child after a fall. What starts as an understandable diversion becomes an obsession. Under the pseudonym ‘Miss Marple’ she blogs on an internet discussion forum about missing children, stirring both constructive debate and dissent. Molly finds public opinion inconsistent, thanks to often inaccurate or sensational media coverage. Using social media her research makes progress while the police investigations stall. Meeting a fellow blogger gives her a major clue to the UK mystery. Ultimately Molly discovers what happened to the missing children but is herself forced to make a fateful decision she never could have envisaged. 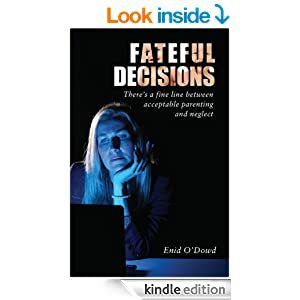 Fateful Decisions leaves readers to ponder what they would have done in similar circumstances.